Work on the first metro line of HCMC, which connects Ben Thanh Market in District 1 and Suoi Tien Theme Park in District 9, could be suspended at the end of this year, due to deferred payment of hefty sums for Japanese contractors. In a letter to HCMC Party chief Nguyen Thien Nhan, Japanese Ambassador to Vietnam Umeda Kunio pointed out two serious problems that are adversely affecting the metro line project, reported the Vietnam News Agency. The project has been funded by Japanese loans since 2007. However, the Vietnamese Government has stopped financing the project from the State budget since October 2017, according to the ambassador. He noted that the Government must gather feedback from the Politburo and the Standing Committee of the National Assembly, which will approve an investment adjustment decision for the project so that its financing based on the State budget can continue. The HCMC government had pledged to advance payments from its own budget until the central Government could allocate its State budget to the project, he added. However, payment procedures for contractors, in fact, did not make any progress; the low payments for the project’s construction and consultancy contractors amounted to over US$100 million, according to the ambassador. He said the pressure on contractors had reached its limits. If these problems are not resolved, work on the project could cease in late December. Therefore, the Japanese side recommended the HCMC authority urgently instruct its relevant departments and agencies, particularly the municipal Management Authority for Urban Railways (MAUR), on ways of dealing with these problems as soon as possible. The ambassador remarked that the contract for the project’s consulting unit, NJPT, a consortium led by Japan’s Nippon Koei, had expired in April 2017. Though the relevant sides had held many negotiations to extend the contract, it has not been amended yet. The consortium had no other choice but to offer its consultancy services without receiving any payments for the past 19 months. The late payments owed to the NJPT consortium now totals up to US$20 million, affecting the payments for other contractors, said Umeda Kunio. Therefore, he proposed the municipal government ask MAUR to sign a memorandum of understanding (MOU) with the consultant on work issues and payment advances. The ambassador also mentioned a construction package, developing an elevated track stretching 17.1 kilometers, is being built by the consortium of Japan’s Sumitomo Corporation and Vietnam’s Civil Engineering Construction Corporation (Cienco). Work on the package started late, due to problems with site clearance. This was why the completion of the package was behind schedule set for January this year, according to the ambassador. He claimed the municipal Department of Finance had cited this reason for not paying construction costs after the completion date of the package listed in its contract. In other words, the payment for construction costs after January was not made. The ambassador cited a statement from the Construction Ministry as saying that it was possible to make the delayed payments. Hence, the Japanese side suggested the city authority should instruct the relevant sides on establishing a procedure for making the payment. He said work on construction packages is still underway, but the payments for finished work have been suspended. Earlier, the local government had asked MAUR to sign an MOU on advancing 80% of the workload’s value until the approval of the project’s design was issued. The ambassador stressed that urban railway line No.1 was a project symbolizing the friendly relations between Japan and Vietnam and was a vital project contributing to the improvement of the living environment and the further economic development of the city. Kicked off in August 2012 as the first line of the city’s metro system, the Ben Thanh-Suoi Tien line will stretch 19.7 kilometers, mostly above ground, and connect the city center with the eastern districts. It is expected to begin operations in 2020, two years later than originally planned. The metro line requires a total investment of some VND28 trillion for the 2016-2020 period. 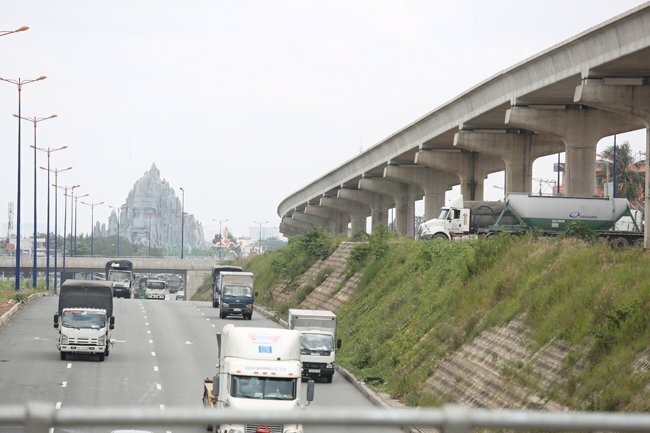 However, the Ministry of Planning and Investment can only allocate VND7.5 trillion to the project, in line with its mid-term public investment plan. Hence, the project is now in dire need of VND20.5 trillion. The National Assembly has yet to consider the total investment adjustment to the project from some VND17.3 billion to VND47.3 trillion, owing to upward price fluctuations for some materials and fuel; an increase in the construction workload, due to basic design adjustments; and changes in the total investment calculation’s factors including the exchange rate and reserve, risk and inflation costs until 2019.